It's the latest venue from the team behind Toorak Wine Cellars and Milton Wine Shop. 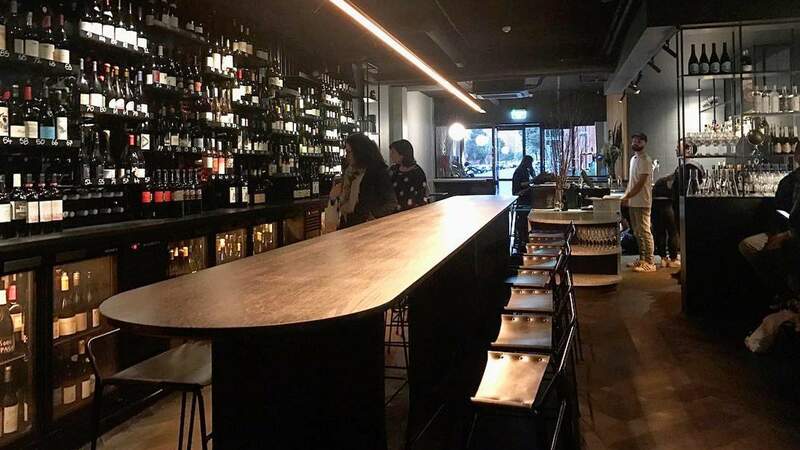 Lyndon Kubis and Mark Nelson have proven they can really deliver when it comes to the wine bar-bottle shop concept, having nailed the formula at the likes of Toorak Wine Cellars and Milton Wine Shop. But this pair's also not afraid to break the mould a little, as you'll discover at their latest venture The Moon. Setting up shop at the bottom of a Collingwood apartment building, this marks the duo's first foray into the northside bar scene, the result a touch moodier and a little more refined. The wine offering, though, is as good as any of them, with a focus on small producers across the board and a curation that that reflects places and regions, rather than processes and technique. A hefty by-the-glass selection celebrates locals and foreign finds in equal measure, alongside two craft beer tap options and a rotating bottled range of boutique brews. There's a serious retail collection sitting pretty along one wall — you can grab a bottle to enjoy then and there, or pick something up on your way home. Foodwise, the menu's all about things you can feast on with just one hand. Keep the other firmly on that glass of Patrick Sullivan 'Gypsy Juice' Pinot Noir, while you tuck into a brisket and jalapeño toastie, chilli-doused pork ribs, or your pick of cheese and charcuterie. The north might be, as Nelson says, "a hard nut to crack", but it sure looks like The Moon is up to the challenge. The Moon is located at 28 Stanley Street, Collingwood and is open daily. For more info, visit themooninmelbourne.com.